On May 22, 2018 in the Historical Park of St. Petersburg "Russia is my history" was the solemn opening of the photo exhibition and presentation of the book by President Gurbanguly Berdimuhamedov "Turkmenistan is the heart of the Great Silk Road". 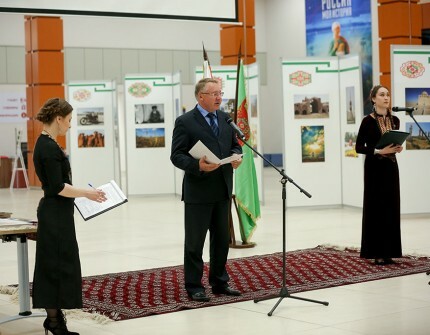 The event was organized by the Department of the Humanitarian Association of World Turkmens in St. Petersburg and Northwest Russia - the Society of Turkmen Culture in St. Petersburg “Mekan” and the Cultural Center "Near East" with the support of the Committee on Interethnic Relations and Implementation of Migration Policy in St. Petersburg, St. Petersburg GKU "St. Petersburg House of Nationalities", the Historical Park "Russia is My History". The ceremony was attended by Deputy Chairman of the Committee on Interethnic Relations V.Okrushko, Chief Mufti of St. Petersburg R.Pancheyev, employees of the Committee on Foreign Relations and the St. Petersburg House of Nationalities, heads of the national cultural associations of the city, representatives of the Turkmen Diaspora, students and youth activists associations, scientists and artists. The photo exhibition "Turkmenistan - the heart of the Great Silk Road" reflects the concept of President Gurbanguly Berdimuhamedov to popularize the unique historical and cultural heritage of the country, archaeological and natural attractions, large-scale achievements, tourist potential, rich traditions and customs of the Turkmen people. In the concert part of the program, the audience was presented with folklore compositions of countries and regions, along which the Great Silk Road passed. Activists of the Council of Turkmen students in St. Petersburg "Bagtyyarlyk" acquainted guests with the art of Bakhshi.